Aliens Everywhere! Enough aliens to fill a cantina! 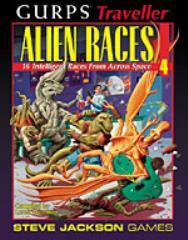 GURPS Traveller Alien Races 4 brings 16 strange species to life. Compiled and edited by Loren Wiseman and Steve Jackson, this book features the creations of several favorite Traveller authors, including Phil Masters, David Pulver, and David Thomas. Here you'll meet: The winged Ael Yael, nearly destroyed by greedy Humaniti, now finding their place in the galaxy. The bureaucratic Bwaps, faithful administrators through three Imperiums . . . but they have their own agenda, and few suspect how decisively they can act on their own. The huge Virushi, calm and nonviolent . . . until they're pushed too far. The newest species to be recognized as sentient, the aquatic Schalli. Will these brilliant, ambitious carnivores be our allies in a hundred years - or our rivals?